An artist's impression of the massive protostar Orion KL Source I. Researchers recently used the ALMA telescope in Chile to precisely measure the rotating gases flowing out from the baby star as it forms. 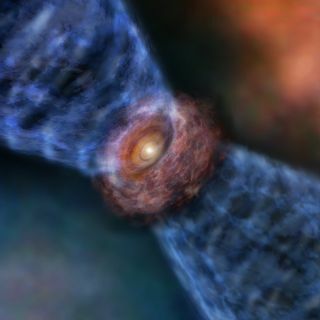 Astronomers using the powerful Atacama Large Millimeter/submillimeter Array (ALMA) in Chile have precisely measured the rotating fountains of gas flowing out from a massive newborn star, revealing the complex interplay between the star's magnetism and centrifugal forces. Astronomers are still puzzled by the way massive stars form in interstellar space, the new study's researchers said in a statement. When a massive rotating cloud of gas collapses under gravity, stellar fusion becomes possible, and a baby star is born. As angular momentum is conserved while the cloud shrinks, the resulting baby star should be spinning very fast, according to the laws of physics. But astronomers have found that stars in our galaxy spin much more slowly than the laws of physics predict they should. Therefore, there must be some mechanism that's dissipating angular momentum from stars soon after they are born, the researchers said. ALMA's observation of the protostar Orion KL Source I. The protostar is in the center, surrounded by a disk of gas (in red). More gas flows out at each of the poles as it's ejected from the forming star (in blue). Located 1,400 light-years away, the Orion Nebula is the nearest star-forming region to Earth, and with ALMA's incredible observing capabilities, the researchers could precisely measure Source I's outflows. Hirota's team noticed that the outflow of stellar gases is rotating in the same direction as the star and that it emanates from Source I's hot gas disk, and not from the star itself. This finding agrees with a theoretical "magnetocentrifugal disk wind model," the researchers said. This image from ALMA data shows the rotation of the gas ejecting from the protostar Orion KL Source I. Red marks gas moving away from us, and blue indicates gas moving toward us. The disk of gas surrounding the protostar is in green. In this model, gas is ejected from the rotating disk and is forced to move outward. Like a spinning lawn sprinkler, propelled by centrifugal forces, the water spirals outward, away from the sprinkler head, siphoning some of the star's angular momentum. But in the case of this star, the spinning gases leaving the disk are also directed up and down along magnetic-field lines to create the spinning outflows that ALMA has detected. And the researchers believe that these flows are dissipating rotational energy from the baby star, slowing down its rotation, and therefore possibly explaining why stars in our galaxy rotate more slowly than expected. "ALMA's resolution will become even higher in the future," Hirota added. "We would like to observe other objects, to improve our understanding of the launching mechanism of outflows and the formation scenario of massive stars with the assistance of theoretical research." Follow Ian @astroengine and www.astroengine.com. Follow us @Spacedotcom, Facebook and Google+. Originally published on Space.com.